1. A man observes that at a point due south of a certain tower its angle of elevation is 60o; he then walks 300 feet due west on a horizontal plane and finds that the angle of elevation is then 30°; find the height of the tower and his original distance from it. 3. A and B are two ships at sea. P and Q are two stations, 1100 m apart, and approximately on the same horizontal level as A and B. At P, AB subtends an angle of 49o and BQ an angle of 31o. At Q, AB subtends an angle of 60o and AP an angle of 62o. Calculate the distance between the ships. 4. In a quadrangular field ABCD, AB runs N62o10'E 11.4 m, BC runs N22o 20'W 19.8 m, and CD runs S4Oo40'W 15.3 m. DA runs S32o10'E but cannot be measured. Find (a) the length of DA and (b) the area of the field. 7. If b=3, c=1 and A = 30o, solve the triangle. 8. Discuss the several special cases when two sides and the angle opposite one of them are given. 9. Prove that the centroid of a triangle lies on the line joining its circumcentre to the orthocentre. Also find the ratio in which it divided that line segment. 10. Three circles with radii 3.0, 5.0, and 9.0 cm are externally tangent. What is the area of the triangle formed by joining their centers? 12. Three circles with centers A, B , and C have respective radii 50, 30, and 20 in and are tangent to each other externally. Find the area of the curvilinear triangle formed by the three circles. 14. In triangle ABC, angle ABC = 45o. Point D is on segment BC such that 2|BD| = |CD| and angle DAB = 15o. Find angle ACB. 15. Point P is located inside triangle ABC (Figure) so that angles PAB, PBC, and PCA are all congruent. The sides of the triangle have lengths |AB| = 13, |BC| = 14, and |CA| = 15, and the tangent of angle PAB is m/n, where m and n are relatively prime positive integers. Find m + n.
18. In triangle ABC, ab= 2 + 30.5 and angle C = 60o. Find the measure of angles A and B. 19. Let ABC be a triangle such that (cot A/2)2 + (2cot B/2)2 + (3cot C/2)2 = (6s/7r)2 where s and r denote its semiperimeter and its inradius, respectively. Prove that triangle ABC is similar to a triangle T whose side lengths are all positive integers with no common divisor and determine these integers. 20. In triangle ABC, a ≤ b ≤ c. As a function of angle C, determine the conditions under which a+b−2R−2r is positive, negative, or zero. 21. 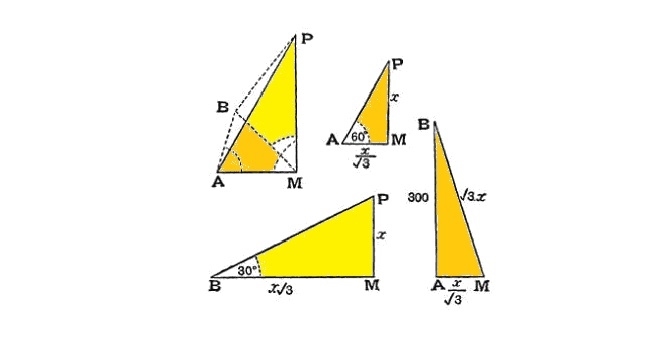 On the sides of a non-obtuse triangle ABC are constructed externally a square P4, a regular m-sided polygon Pm, and a regular n-sided polygon Pn. The centers of the square and the two polygons form an equilateral triangle. Prove that m = n = 6, and find the angles of triangle ABC. Companion MCQ Quiz #1 for Heights and Distances (Basic Problems) - test how much you know about the topic. Your score will be e-mailed to you at the address you provide. Companion MCQ Quiz #2 on the Basics of Angles/Sides/Area of Triangles; In-Circle, Circum-Circle, Escribed-Circle of Triangles: Test how much you know about the topic. Your score will be e-mailed to you at the address you provide. Companion MCQ Quiz #3 for Heights and Distances - test how much you know about the topic. Your score will be e-mailed to you at the address you provide.